Food supplement. The extremely powerful draining drink is now even better, faster and stronger! Reset your lymphatic system and lose weight faster. WaterOut has over a quarter of a million users all over Europe. The vast majority of them agree: they would definitely buy it again! 10 sachets for 10 days. 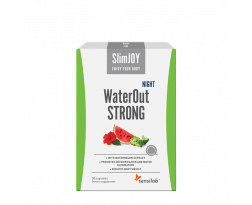 WaterOut, a SlimJOY best-seller, has the fastest and most visible slimming effects. it will finally allow you to get rid of water weight - and boost your weight loss progress! Step up your lymphatic flow, flush out excess water and supercharge your fat burn. With the ALL-NEW WaterOut STRONG and its substantially-improved formula, you can finally get VISIBLE slimming results – in just a few days! shows its first slimming results in just 1 week. As an added bonus, it helps reduce cellulite and enables you to retain essential minerals despite losing excess water. Providing fast and impressive results, WaterOut enjoys the full support of 80% of its users! With its new and improved formula, the sky is the limit! The lymphatic system can be considered the body's drainage system, since it filters and eliminates excess water and toxins from the body. Additionally, it enables the transport of fats and fat-soluble vitamins and facilitates their absorption. When the lymph is clogged, all the toxins and fats are stuck in your body, which is why you feel bloated and find it impossible to lose weight. WaterOut STRONG improves circulation and provides the cells with much-needed oxygen. Oxygen is crucial for fat metabolism, so the more there is, the more fat your body can burn. The best way to reduce bloating and swelling is by eliminating excess water. Do this and kick-start your fat burn by cleansing and stimulating the lymph, your body's ultimate drainage system. 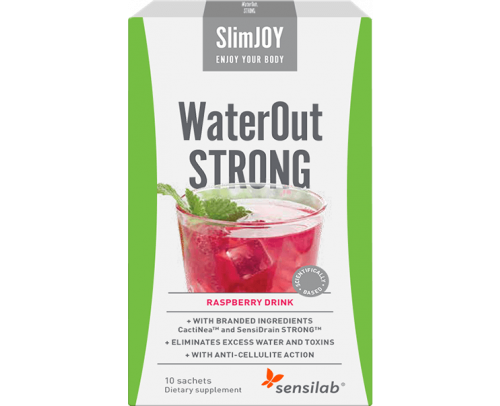 WaterOut STRONG contains our bestselling WaterOut formula which has been drastically enhanced to provide even better results. 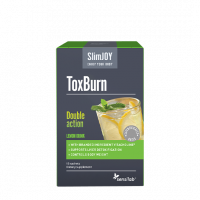 The already-powerful mix of synergistic ingredients has been upgraded with horsetail and a substantially-increased concentration of artichoke, milk thistle and whole red grape extracts for a greatly-increased diuretic effect and much faster weight loss. Say NO to bloating and swelling! It’s time to finally get rid of excess water – and fat – and to do it as quickly as (safely) possible! Consumers have spoken: SlimJOY has been awarded the prestigious QUDAL® medal for the best-quality products on the Slovenian market issued by ICERTIAS, the independent market-research and certification organisation from Zürich, Switzerland. Ingredients: Prickly pear fruit powder with 0.05% betalains and 0.03% indicaxanthin, horsetail aerial parts extract, carrier: corn dextrin, sarsaparilla root extract, Java tea leaf extract with 2% potassium, raspberry fruit juice concentrate powder, natural raspberry flavour, acidity regulator: citric acid, artichoke leaf extract with 2-5% cynarin, milk thistle dried fruit extract, dandelion root extract with 3-5% chlorogenic acid and 12% inulin, red whole grape extract with 75% total polyphenols and 50% OPC (content of sulphites >10 mg/kg), anti-caking agent: rice concentrate, sweetener: sucralose. Use: The recommended daily intake is 1 sachet dissolved in 1 litre of water and drunk throughout the morning. Important: The recommended daily intake should not be exceeded. Dietary supplements should not be used as a substitute for a varied and balanced diet and a healthy lifestyle, which are important. Storage: Keep out of the reach of children! Store in a dark, dry place at a temperature below 25°C.